in direct collaboration with other Directors/Producers. 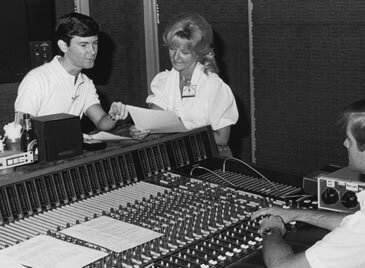 Les directing Kathryn Beaumont, the original voice of Alice in Wonderland and Wendy in Peter Pan for The New Fantasyland rides at Disneyland park. Les Perkins has won more than 80 awards creating bonus features for DVDs, such as Walt Disney’s Mary Poppins; editing the PBS-TV series Jay Jay the Jet Plane; and celebrity tributes. Broadcast projects have included Discovery Channel, PBS, Disney Channel, and webisodes for Disney’s Internet Group. A member of the Producer’s Guild of America (PGA), Les is that unusual creative and technical blend of Producer/Editor, humorously known as a “Preditor,” infusing his editing with engaging storytelling qualities, problem-solving and economy. Please click Portfolio and Demos for more info. 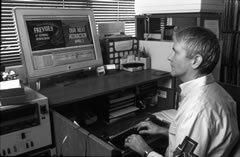 Prior to forming Les Is More Productions in 1997, Les was a Creative Executive at The Walt Disney Company and Warner Bros., supervising more than 1500 projects. In an entrepreneuring effort, working with Disney top management, Les created Disney Character Voices to ensure quality and consistency of audio production across the corporation. That expanded internationally, setting a new standard throughout the entire dubbing industry worldwide. In 1996, he was sought by Warner Bros. to establish a similar operation. Les began his career in the Disney Studio Archives, quickly becoming a Producer in Disney’s educational division. Expanding a Writer job at Walt Disney Imagineering, he went on to produce all the audio for The New Fantasyland upgrade at Disneyland in the mid-1980s. This led to Directing and Casting the first season of The Real Ghostbusters series for DIC/ABC-TV, a couple of NBC-TV specials, and became the genesis for Disney Character Voices. He was subsequently promoted to Creative Director, Consumer Products, Disney Ice Shows, a position created to acquire his special talents. Additionally, Les is an entertainment historian and researcher, often finding rare film and sound elements. He has contributed to books, CDs, and video projects, including The Age of Believing recently produced by FitzFilm for Turner Classic Movies. Click here for Resume in PDF format.